As Elizabeth Barrett Browning came to the end of her heartfelt sonnet to Robert, I have also come to the end of my raptures for the one I love – Shu Uemura. I deliberately deliberated over what to base the last reason on, and settled on this – the amazing (but oh so naughty) collaborations and limited edition ranges that Shu Uemura come out with that keep me dreaming (and spending my hard earned cash). Karl Lagerfeld, Ob, and 30th anniversary offerings – they are just too beautiful and tempting to resist. The products. The packaging. All too alluring for its own good. As Oscar Wilde put it, “I can resist everything except temptation,” and as it was with Oscar, so it is with me. One reason to keep coming back for more is the wonderful point card system that is in place. You can hoard up your points and save them for something you really like. If you spend money with them, they make you feel fabulous. Any cynical person would point out that the amount spent is positively disgusting and they should therefore make you feel fabulous, but I don’t care – it’s still nice. There are also always a variety of special limited edition products on offer with purchases of a certain amount. 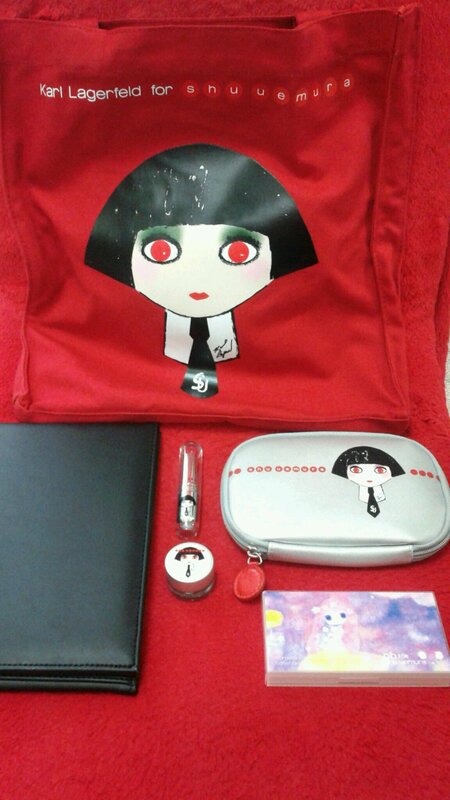 I have received a simple shopper bag, a lovely standalone makeup mirror, and most recently, a tissue box. It may not seem like much, but they certainly know how to make a customer feel valued. My Shu obsession does not seem likely to end any time soon, unless it is with a visit to my nearest counter. A Shu girl I am, and a Shu girl I will remain (for now anyway). In fact, I am already thinking about my eventual next purchase, which I have decided will be the popular Tsuya Skin Essence. Carrie Bradshaw loves shoes, and I love Shu.